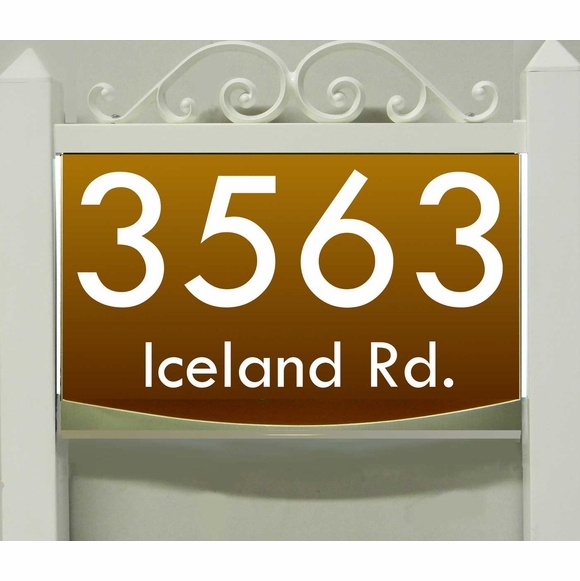 Deluxe LED Lighted Yard Address Sign - - features a beautiful scrollwork topper. Personalized LED lights illuminate your address for better visibility, provide landscape lighting, and enhance curb appeal. Made in USA. Personalized with the lens color, font style, power option, and house number & street name you supply. Six lens colors (click first small image): black, burgundy, chocolate, burnt orange, blue, and green. Five font options (click second small image): twcent (shown in large image), century 751, poor richard, brushed script, and vonique. House number line holds up to five (5) large 3.825" high-visibility numbers. Street name line holds up to twenty (20) 1.5" characters. Address shown in large image: 3563 Iceland Rd.